José Andrés, if you’re reading (yea right), you might want to stop. When I used to live in DC, there was this big event once a year or so when Chef Andrés would set up a huge paella wok thing outside in downtown DC and cook paella for like a million people. I never was able to go to it. Sad face. 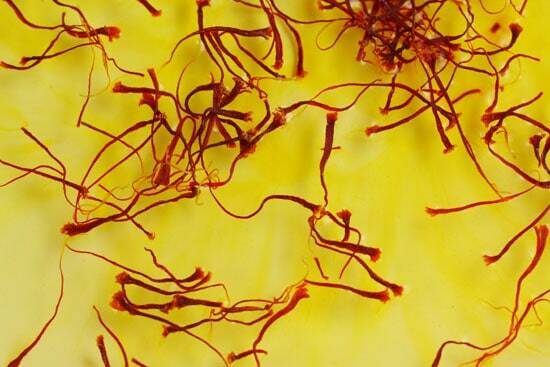 Recently, I was blessed with a fair amount of really good saffron from a few worldwide travelers and so I figured What the Hay. I can make paella. And I can. And it was good. But I started with chef Andrés’s recipe and ended up with something else altogether. So, if you happen to be him, sorry for mutilating your recipe, dude. 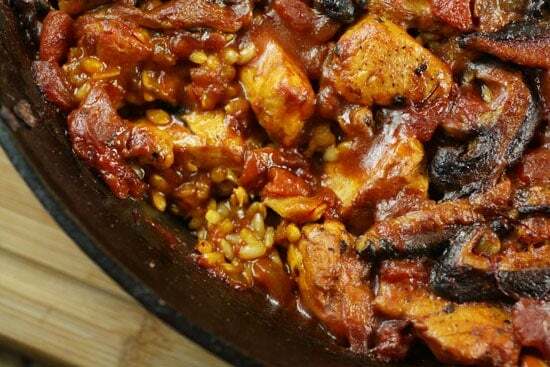 A chicken paella recipe adapted for a cast iron skillet. Served with a garlic aioli. 1) For allioli, smash garlic cloves and add them to a medium bowl. Use a fork to mash them up even more. Whisk in egg yolks, vinegar, water, and salt. 2) Set bowl over a water bath with simmering water (don’t let the bowl touch the water). Whisk continuously until temp is 140 degrees. It should take about 3 minutes and be hot to the touch, but not boiling. Continue to whisk, keeping it at that temperature for 3 more minutes. 3) Let yolk mixture cool and then whisk in oil in a steady, slow steam. Whisk constantly and it should thicken up. Season with black pepper. This can be made in advance and stored in the fridge. 4) For Paella, bring 3 cups of water to a boil and add to a bowl with dried mushrooms. Let reconstitute for about an hour. Then strain broth and squeeze any liquid you can out of mushrooms. 5) Dice fresh mushrooms, onion, garlic, and chicken. 6) Add a few tablespoons of oil to a cast iron skillet over high heat. Sear chicken in two batches for about 5 minutes per batch. Chicken doesn’t need to be cooked through, just seared. 7) Remove to a bowl. Add a bit more oil and sear mushrooms. After a few minutes add onions and garlic and continue to cook. Season with salt and pepper and cook for another minute or two until slightly soft, but not completely cooked. 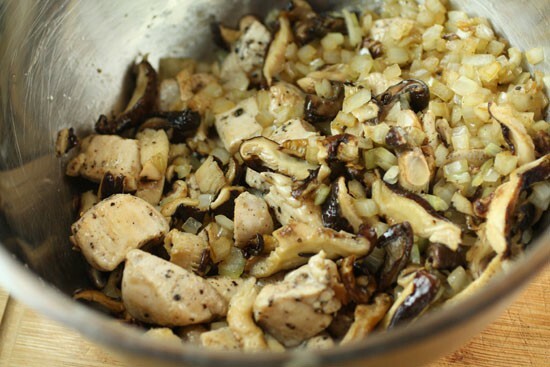 8) Add mushrooms and onions to chicken and set aside. 9) Add a bit more oil to pan along with rice. Stir over medium-high heat for about a minute to coat rice. 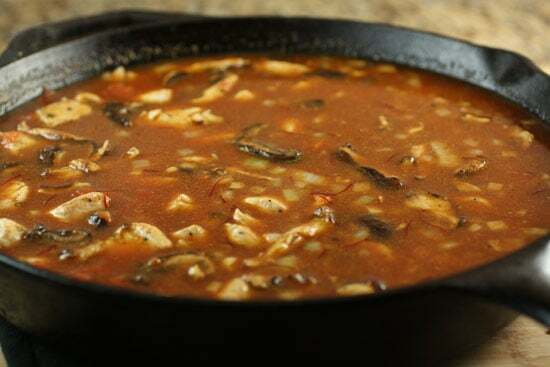 10) Add mushroom broth, spices, tomatoes, saffron (and broth), chicken, onions, mushrooms, and 1/2-1 Cup of chicken stock. The liquid should just cover all the ingredients. 11) Bring to a simmer on the stove and then add to a 400 degree oven. Cook for 30-40 minutes, checking frequently. If it is dry at any point and the rice still isn’t cooked, add a bit more stock. 12) It’s done with the edges are a bit crusty and the rice is cooked al dente. 13) Serve with chopped parsley and allioli. Crazily adapted from this recipe. Like I said, I made a few changes to this recipe. One, I think, was a particularly good idea and one was a particularly bad idea. I decided to not use any shrimp in my version, but if I had access to really good, large shrimp, I would totally use them. I think the lightness of the seafood would help the dish. But this was neither here nor there. I think my good idea was to make this in a cast iron skillet. It allowed for even heat distribution and you ended up with some crusty edges which is what paella is known for. Normally paella is made in a very specialized pan, but if you aren’t making it regularly, it makes sense to use something that you probably have on hand. My bad idea was using brown rice instead of white rice. It took forever to cook. Don’t do this. Just use short grain white rice (although not the instant kind) and you’ll be in much better shape. If you can find specially labeled paella rice, even better. There some good spicy flavors going on in this dish and a garlic-packed sauce is the perfect complement. 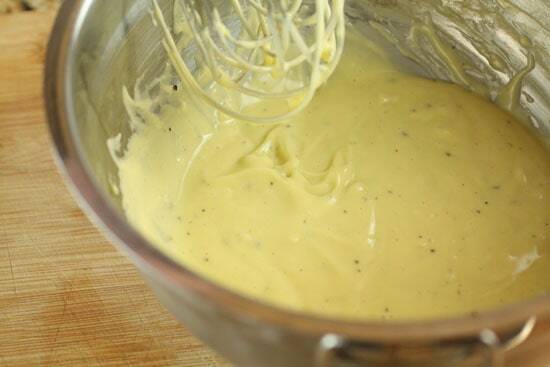 Allioli, or aioli, is almost like a mayonnaise, but slightly different. You heat the egg yolks first and pack in other flavors: mainly garlic. So you’ll need these things! Start by smashing your garlic cloves and adding them to a medium bowl. Use a fork to mash them up a bit in the bowl. Then whisk in the egg yolks, water, vinegar, and salt. Set this bowl over a simmering water bath, but make sure that the bowl doesn’t touch the water. Continue to whisk until the eggs reach about 140 degrees. A thermometer really helps, but if you don’t have one handy, it should be hot to the touch, but not burning or simmering at all. Continue to whisk, maintaining that temperature for 3 minutes. Be careful not to let it get too hot or the eggs will completely cook. Then remove it from the heat and let the yolks cool completely to room temperature. Next, gradually whisk in oil in a very thin stream until mixture is thick. 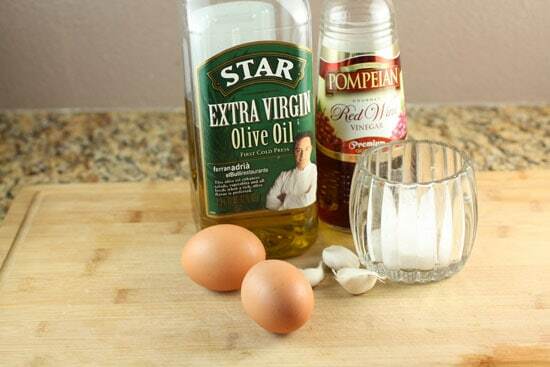 Cooking the yolks makes it a bit easier to incorporate the oil. Then season with pepper! You can make this in advance without a problem. I think it gets a bit better after a chill in the fridge. Aioli is a weird word. To start the paella, be sure to prep all your ingredients. This is one of those dishes where it’s kind of annoying to have to stop to chop an onion or something, so just make sure you have everything ready. 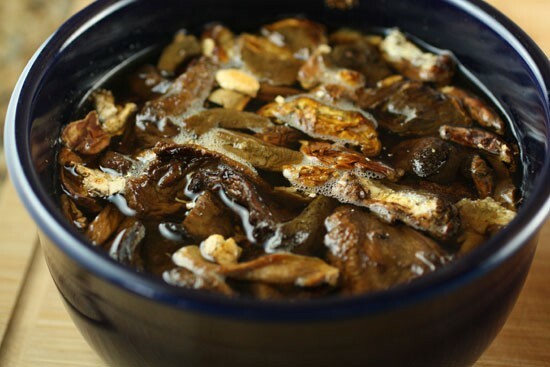 To start this, bring 3 cups of water to a rolling boil and add it to a bowl with the dried mushrooms. Let these sit for about an hour to reconstitute. When you’re ready, strain the broth out and squeeze as much liquid as possible from the mushrooms. Even though it’s kind of gross, I literally pick up the shrooms and wring them out like a wash cloth. There’s tons of flavor in those guys that you don’t want to waste. Meanwhile, dice up the fresh mushrooms and an onion, and cube up the chicken. In your cast iron skillet, add two tablespoons of oil over high heat. Add the chicken in two batches, searing the pieces well on each side. After the chicken is seared (about five minutes), remove it to a bowl and add a bit more oil. Then add the mushrooms and cook for another few minutes until they are seared. Finally add the onions and chopped garlic and season with a good pinch of salt and pepper. Cook all this for just a minute or two on high heat. You goal is just to get them started and bring some flavor to the party. 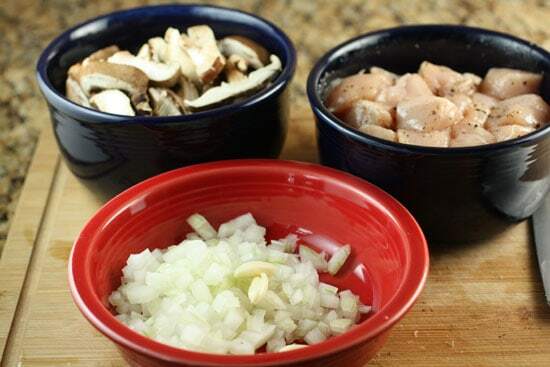 Then you can add your mushrooms and onions to your chicken. Working with saffron is super-fun. This is the first time I’ve had my hands on some really good stuff. I added my saffron to about 1/2 Cup of water to let them kind of bloom and start giving off some color. To get the paella ready for the oven, add a few more tablespoons of oil to the pan along with the rice over medium high heat. Again, don’t use brown rice like me people. It was a bad idea. Use the right rice please. Once the rice is coated well with oil and hot, add 3 cups of the mushroom stock the pan. Also add the tomatoes, spices, saffron (and broth). Then stir in all the chicken, mushrooms, and onions. Add about 1/2-1 Cup of chicken stock to the dish. The liquid should basically cover the other ingredients. Bring this all to a simmer on the stove top and then add it to a 400 degree oven, uncovered. It will probably need to cook for somewhere between 30-40 minutes. Check it frequently if it looks really dry at any point, but the rice isn’t cooked, add a bit more chicken stock. It’s done when the liquid is gone and the rice is cooked through. If you were to add seafood to this, you would want to add it in the last few minutes. Cooking shrimp for 30 minutes is never a good idea. This dish had lots of really good flavor, but my rice never really cooked all the way through. Brown rice is just too sturdy to use in a dish like this. I ended up cooking mine for about 75 minutes and eventually the rice softened enough that we could eat it. So feel free to make this. It was delicious. Just use the right kind of rice. Just add the right rice!! This looks awesome- I want to make this soon! Happy to see that you are still learning as you cook too- it gives me hope and allows me to quit cursing at myself when something goes wrong :) The kitchen can be such an unforgiving place sometimes. Oh yea. I still have plenty of mess ups. This was one that still ended up edible, but yea… it was a pain in the but getting brown rice to cook through with this recipe. When I made paella (decades ago….) I included shrimp, chorizo and clams or mussels. Adds to the flavor a bit. I love throwing chorizo in a paella, the oils that come out when it cooks adds great flavour throughout. I have a paella on my blog, and I used paella rice which I think is just the same as arborio rice which is easier to find. It cooked in about 30 minutes. I just recently was lucky enough to be in Barcelona and had to try some, but it was a little dissapointing and made me feel quite proud of mine. 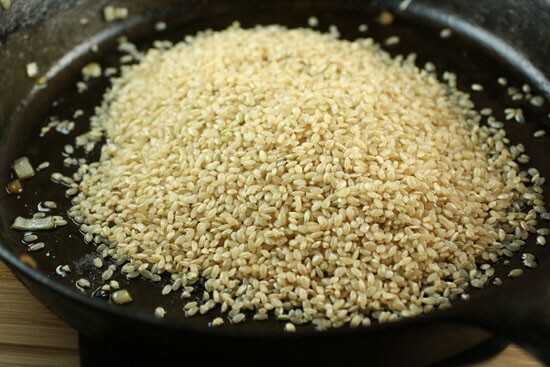 I have found that my brown rice will not cook through if I "toast" it in the oil, as most recipes suggest doing. It seems to lock the outer layer, and not let enough liquid penetrate, so when I use brown rice, which is pretty much always, I just add it after I add the liquid to any recipe. It does take longer than white rice to cook though. The rice used on Paella is called Bomba ( Bomb ), it's similar to Arborio but not the same, but it's a good alternative if you find it. Better a round grain rice, not a long grain. Rice must absorb a lot of liquid for a good Paella. And an important tip: Here in Spain, usually last 5 minutes of cooking is made in the oven, not on fire. Heat the oven, and put the pan inside for 5 minutes. MANU, I’m from Valencia, and I tell you that Paella is not made in the oven. Only on fire. Paella is one of my favorite dishes but I prefer it with seafood. If you want to use brown rice, you could cook the rice in a rice cooker, while the mushrooms are reconstituting. Then add the rice to the other ingredients later.